Fran is a handsome yacht with long, sleek lines, an Elan 40, built in 2002. 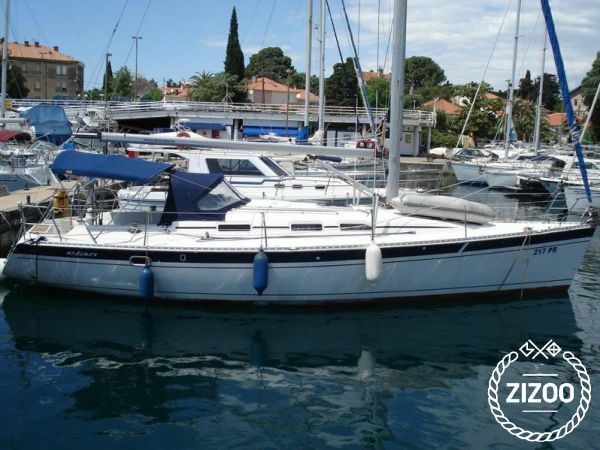 It will appeal both to the sailor who enjoys spending time out on the racecourse and to the cruising yachtsman looking for a fast and capable sailing boat. A large wheel mounted right at the back of the boat reveals that the primary purpose is the enjoyment of sailing in sparkling conditions, but down below you will find ample room for relaxation in the central saloon and three double cabins, making it ideal for extended family cruising. Chartered by Bruneko Charter, a small family-owned company dedicated to providing quality and well-equipped boats ensuring pleasant holidays, and located at Marina Tankerkomerc in Zadar, Fran has one of the best starting points on the Adriatic for exploring and enjoying the most beautiful and exciting destinations. Pack up your family and friends, get them on board of this versatile vessel and experience the fantasy of your best holiday ever.